Set against drab cityscape abstractions, the warmth of this story is surprising. Two boys, upon discovering a tree which will soon be swallowed up by a giant condominium, decide to make a difference by relocating the tree to a hillside. 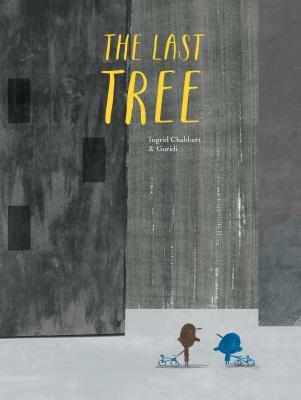 Lovely and compassionate despite its simplicity, The Last Tree is an object lesson for all. A small boy longed to roll and play in the grass like his father had when he was a child. But the boy lived in a concrete city without any grass or trees. Instead, they ?had roads, walls and lots of other ugly things.? Then one day the boy and his friend discovered a sapling hiding behind a low wall. The boy had never seen a tree before. He was so amazed, he dreamed about the tree. ?I imagined it tall. Huge, even. And majestic,? he says. So when they heard that a condominium was being built right on the spot where their tree was growing, the friends knew they had to dig it up and replant it in a safe place. They had to make sure the last tree survived.